Many hedgehog owners and potential owners enjoy looking at pictures of available babies. We do our very best to take pictures that accurately represent our animals. We offer the opportunity to purchase specific babies by listing babies online with pictures. We do our best to update pictures that are more than three weeks old. 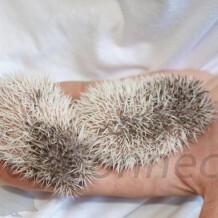 You may notice color markings on the hedgehog in the online pictures. This is a way that we mark our babies so we can tell them apart since many babies look identical or very similar. Our Premier Plan babies are given names and listed online. Names can be changed of course, but we name them because they are animals that are staying in our record keeping system. Only limited numbers of Discount Plan babies are listed with actual pictures. Pictures require a considerable amount of time to post online. Discount Plan babies are less expensive in part because they do not have all the advantages of the Premier Plan. Some of our customers prefer to handle several babies and to choose the baby that they like the best. This type of customer is one that is not concerned about color as much as personality and how the hedgehog responds to being handled by an individual. We will do our best to provide as many choices as possible for selection without an advance reservation. Please keep in mind that we cannot guarantee availability without a deposit. Our inventory changes quite frequently and we do our best to maintain our online listings but there are times when animals sell and it takes some time before we can change the listing. By reserving a specific baby you are guaranteed that at least that particular baby will be available for you to purchase. As described above, Premier Plan purchases will have a general idea of what babies will be available for selection based on the babies listed online. We will not notify our Discount Plan customers what babies will be in their selection group because availability of babies in this group changes daily. Specific hedgehogs are reserved through our Premier Plan. Many of our customers have specific color requests and we are happy to honor these requests. “Split-face”, blaze mask, reverse pinto, black-eyed white, and white face standards are some popular colors that we often sell in advance through our Premier Plan. General color preference refers to the fact that some people do not want a hedgehog with red eyes or they prefer the standard color. A “chocolate chip” would be a color preference but a request for a non-albino would not be a specific request. Albino babies are the main exception to the “specific color request” that can be purchased through our Discount Plan.